Full Title : "Good Omens - The Nice And Accurate Prophecies of Agnes Nutter, Witch". 1990; 398 pages. Genre : Fantasy Satire. Overall Rating : B+. Armageddon is coming! Aliens are descending, Atlantis is rising, and Tibetans are tunneling. Far beneath the abyssal sea the kraken stirs, and ten billion sushi dinners cry out for vengeance. The 4 horsemen of the Apocalypse (War, Famine, Death and Pollution. Pestilence retired when penicillin was discovered) have gathered and there's just one small problem - the Antichrist seems to have been mislaid. This is delightful silliness with a bunch of very likeable characters. Among them are the eventually-found Antichrist and his playmates; Newton Pulsifier (witchfinder), and Anathema Device (professional descendant and occultist). The main stars are two angels - Aziraphale (who moonlights as a rare-book collector) and Crowley (who did not so much fall as to saunter vaguely downwards). These two have counterbalanced each other for 6,000 years and 15 minutes. Over time, a friendship has developed and neither one is very keen on the End of the World happening just now. The storyline is well-structured. There are a slew of threads that converge nicely at the end. Gaiman and Pratchett make a good team, although I think Pratchett wrote the majority of Good Omens. You can find his trademark mangled metaphors here, and his always-witty footnotes. And Death, who always speaks in UPPERCASE LETTERS, is a direct import from Discworld. "It was going to be a dark and stormy night." 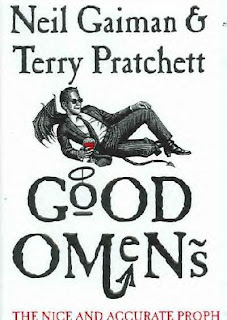 As good as Good Omens is, it didn't fall into the "couldn't put it down" category for me. I think the weakness is the subject matter itself. Armageddon is just not that funny of a topic. It's kinda like Monty Python doing a movie about the Bubonic Plague. Yes, you can come up with some nifty one-liners ("Bring out your dead!"). But not two hours' worth of wit. The same applies here - it's very ambitious, yet well nigh impossible to write 400 pages of zaniness about Armageddon. Nevertheless, Gaiman & Pratchett do an excellent job. Underneath all the satire, there are some very good eschatological (jeez, I've always wanted to use that word in a review.) issues addressed here. So we'll give it a B+ rating and recommend it to anyone who isn't in deathly fear of the Book of Revelation. I'm reading Stardust and Coraline with my daughter right now and am currently going through a Neil Gaiman phase. Neverwhere is next. Have you read that one? This one sounds good too, although a much earlier work. His writing reminds me alot of Roald Dahl, a favorite childhood author of mine. That's probably why I'm liking him so much. He's very...quirky. I really liked Coraline, and I'm planning to read Stardust this year. I read American Gods last year and really didn't like it, but if Stardust turns out alright, I'll probably try Anansi Boys. I've been told it's better than American Gods despite being a sequel. I've heard Neverwhere is a companion to a TV series, and possibly might not be good as a standalone book, but i haven't read it. The Graveyard Book just won the Newberry last week. Everyone I know that's read it absolutely loves it. I've heard that, too. I want to read that one and M is for Magic, too. You should include a link to the definition of "eschatological." I had to copy and paste that one into merriam-webster.com! Ha. I'm always dumber than I thought I was. heh, Amber. i only managed to spell it right on the fourth try or so. i forgot that there was an "h" hiding in it somewhere. this was my first Neil Gaiman book, and i'm looking forward reading more of his works. for me, "quirky" is good in an author. i saw American Gods at the library, and Sandman looks promising too. I didn't find American Gods that quirky.